Typically when I have bunch of random food in the fridge that needs to be used up, it gets tossed in a risotto. It's an easy one-pot method to make miscellaneous meat, cheese, and veggies disappear. Then last week I found myself with a fridge of leftover salad fixings, cheese bits, and an unopened package of chicken sausages that never made it to the grill (rained out), and lots of leftover bread that had gone stale. The new one-pot method, I decided, would be a bread pudding. And unlike risotto, bread pudding needs no tending while it cooks. So while it's baking you have almost an hour of free time to do really important things, like make cocktails or set Lost to record. 1. Saute sausage, onion, and red pepper until sausage is lightly brown and veggies are tender. Set aside. *If you're using a sausage that hasn't been pre-cooked (i.e., not “ready to eat”) then add the meat first-- after the sausage is brown and crumbly, add the onion and peppers. 2. Combine ingredients milk through salt and pepper in a large bowl. Whisk to mix. 3. Stir in sausage mixture, then add bread. Mix gently. Let stand about 10 minutes, stirring again after 5 minutes. 4. Pour mixture into a large, greased casserole dish. Bake at 350º for 45 minutes. Let stand 5 five minutes before serving. 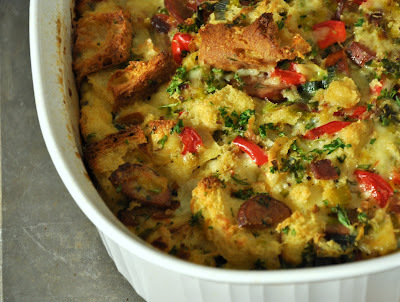 Good to know: The more dry and stale your bread is, the more suitable it will be for a bread pudding—more milk will be absorbed, giving the dish a better consistency. Sourdough is my favorite. Wow!I was about to throw out some old stale bread,I'd love to try this.If you won't mind, I'd really love to guide foodista readers to your site. Just add your choice of Foodista widget at the end of this blog post and you're all set. Thanks!